We’ve discussed The Donald in these pages before. Almost every time we’ve come back from the ordeal beaten and bloodied after perusing our reader responses. Is Trump the “democratic tyrant” that Plato warns us about in his The Republic? We pondered that question some months ago. Seemed plausible at the time, but maybe we had the guy wrong. Perhaps Big Don isn’t a fear monger at all. He might just be a classical reader! Sure, he’s the kinda guy that wants to build a wall because those damn foreigners are coming to kill us. That brings us to our bit of history for today. Building walls was not an unusual occurrence in the ancient world. Off the top of your head, you could probably name the Great Wall of China, the Walls of Benin, or perhaps even Hadrian’s Wall. Defensive walls were an integral part of the ancient world. During the infancy of human civilization, marauding pirates, encroaching foreign armies, and addled emperors with a penchant for putting entire cities to the flame were vey real concerns. Today we look at one particular set of walls. 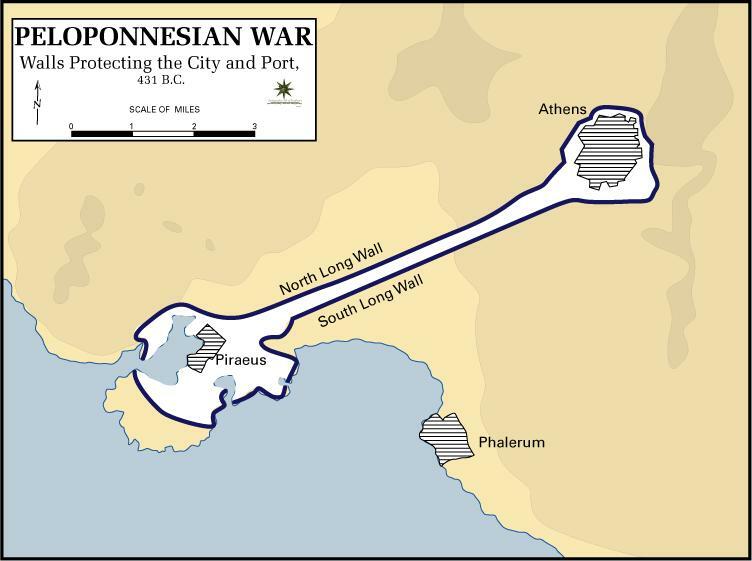 They are the Long Walls of ancient Athens described by Thucydides in his The History of the Peloponnesian War. The walls of the ancient Athenian city began construction during the lead up to the Peloponnesian War in the mid 5th century BC. N.B. The Persian armies of King Xerxes had previously destroyed the Athenian walls during the Greco-Persian wars several decades earlier. An interesting piece of engineering, defensive walls were erected around the city proper, but construction also began on a series of 6km “Long Walls” that would connect the city of Athens to its ports at Piraeus. The Long Walls created a protected corridor that could provide a valuable link to the sea, even during times of siege. More interesting than the walls themselves was the story behind how they were built. 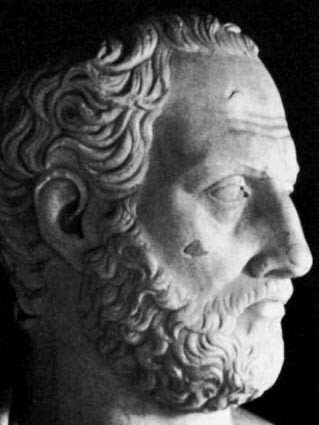 The historian Thucydides tells us that after the successful expulsion of the Persian armies, the Spartan Greeks looked upon Athens with fear and mistrust. In the course of “defending” smaller cities from the Persians, Athens had acquired herself a sizeable empire. The Athenians coerced or otherwise intimidated smaller cities to join their military coalition or otherwise face destruction. Fearing the strength of a fortified Athenian city, the Spartans pleaded with Athens to not reconstruct the defensive walls. They would have themselves preferred to see neither her nor any other city in possession of a wall; though here they acted principally at the instigation of their allies, who were alarmed at the strength of her newly acquired navy and the valour which she had displayed in the war with the Medes. 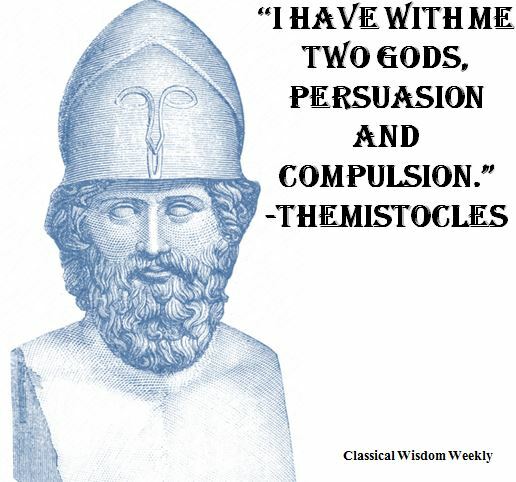 Themistocles, the man largely credited with orchestrating the Greek victory over the Persians, informed the Spartans that he would sit with them and discuss the proposition. Themistocles proceeded at once to Sparta but informed his countrymen to delay the departure of the other emissaries. Upon his arrival, the general stalled for time and made excuses. His colleagues had yet to arrive, you see, so he couldn’t possibly go before the Spartan assembly to discuss the prospect of an Athenian wall. The Spartans trusted Themistocles, a man who was for years their ally. However, unbeknownst to them, the construction of the Athenian wall had already begun. The Spartans heard rumors of the wall and deployed emissaries to confirm the reports. Themistocles secretly sent word to the Athenians to capture the emissaries and detain them indefinitely. 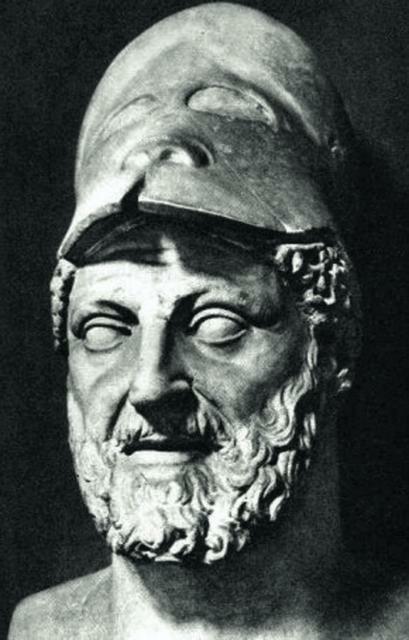 By this time, construction of the Athenian walls was far enough along that Themistocles felt it safe to drop his ruse. He announced openly that the Athenian wall, to the great consternation of the Spartans, had already been constructed. In essence, saying: Whaddya gonna do about it? By this time our mind drifts back to the modern age. Is it fair to The Donald to compare him to ancient demagogues? While we’re at it, is it fair to the demagogues to compare them to Trump? No answers for certain…but we sure would love to hear what you have to say, dear reader. For now though, let’s be content with our examination of this unique bit of history. We don’t know precisely how Themistocles made his case to the Athenian people, what stirring rhetoric he must have employed. And Sparta’s going to pay for it! It was not often said of the Romans that they were an empire tolerant of seditious behaviour. 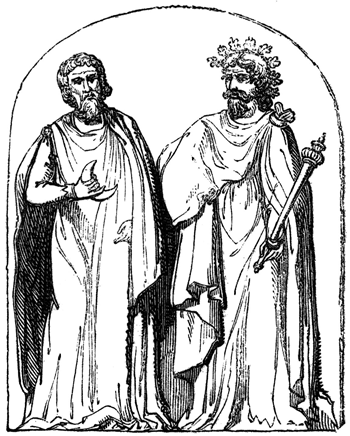 Though arguments can be made that they often bestowed certain benefits on the peoples they subjugated (a certain well-known scene from Monty Python’s Life of Brian springs to mind), once a nation lost its statehood and became a Roman territory, acts of physical dissent were not taken, in any sense, as constructive criticism. Thus, when the people of Judea rose up to initiate the First Jewish-Roman War (66-73AD), the Latin overlords neither ‘umm-ed’ nor ‘ahh-ed’ about the course to take next. The responsibility for putting the Jews back in their place, and reinforcing that said place now belonged not to them, but to Rome, fell to the legate of Syria, Cestius Gallus. Whether through incompetence or an underestimation of the foe, and despite some initial gains, Gallus was soon humbled at the Battle of Beth Horon—at which he not only lost 6000 men, but the very symbol of Roman imperium, the legion’s eagle! For the Jews, this great victory was a recruiting tool no amount of Roman repression could equal; there was now belief that the interlopers in their land could not merely be resisted, but defeated. The Romans soon realized that this conflict was not going to be won simply because the enemy were overawed by their shiny breastplates and neat formations, this was a fight that needed to be taken seriously. In true Hollywood style, the floundering Emperor Nero turned to a legendary commander, one currently in the political wilderness (having previously been booted off the ‘force’ (possibly for falling asleep during one of Nero’s theatrical recitals)), but who was now called back for one last job because, damn it, he was the best. This was how Vespasian, together with his son Titus and 60,000 troops, began systematically breaking the Jewish resistance in town after town across Judea. The wily old soldier knew that, as long as he was making headway, as long as cities were falling and Jews were dying, there was no need to engage the bastion of Jerusalem itself, but leave the rebels to stew and hear daily news of their comrades’ deaths or enslavements. 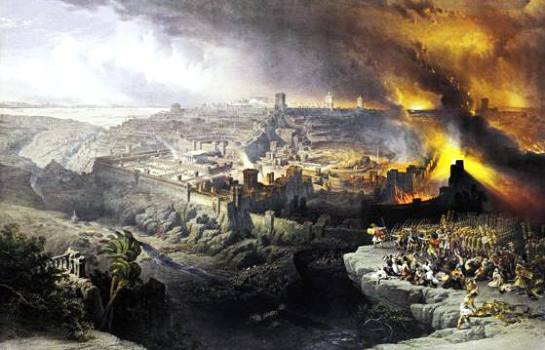 Another, unforeseen, advantage for the Romans was that the radicals they failed to kill in the outlying towns fled to, and took refuge in, Jerusalem. And, as is so often the case when schisms abound, vicious infighting broke out. There resulted, therefore, a bizarre situation wherein the hardliner Jewish forces (the Zealots) were besieged inside the Temple by the more moderate faction, themselves inside the city walls. A separate, but equally radical group (the Edomites) came to relieve their fellow extremists who managed to sneak out of the Temple and unbar the gates during a thunderstorm, thus admitting their remorseless comrades. The result would undoubtedly have brought a smile to Vespasian’s lips; at least 6000 Jewish soldiers and countless civilians lost their lives. The cruel irony is that this occurred in 68AD, a year in which Rome was at her weakest. The assisted suicide of Nero had ushered in the Empire’s own era of civil infighting in what was to become known as the Year of the Four Emperors; the fourth and final of which was a popular soldier who had shown great skill, tact and loyalty to his country, Vespasian. 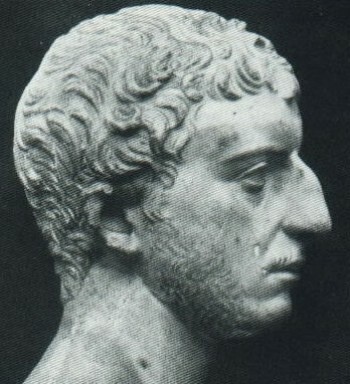 The new Emperor left Judea in the charge of his son, Titus (who would one day also inherit the throne from his father). Titus, finally unbound from the steady and prudent influence of his sire, unleashed his youthful impetuosity by marching on and besieging Jerusalem – though not without decimating any unfortunate towns that lay in his wake. The siege was, in engineering terms, a colossal one. Titus’ forces dug a trench around the entire city’s circumference and, outside of that, built their own walls to completely isolate Jerusalem from the wider world – as well as ensuring anyone exiting it was promptly caught and crucified. In spite of the enemy being at the gates, infighting was still prevalent in the city itself; a masochistic bickering epitomised by the decision of the Zealots to burn the city’s food reserves in order to force the undecided into an ultimatum: fight or starve. Though many suffered the latter fate, the city finally began to cohesively defend itself as the threat of a full-on Roman assault became evermore imminent. Jewish historian, Josephus, claimed it was about double that. Either way, such numbers would have meant that this once proud beacon of Jewish civilisation could only have been a picture of squalor, starvation, disease and death during the seven long months that Titus’ troops took to breach the three, seemingly impenetrable, walls; they finally managed to break through in the summer of 70AD. Once inside, the Romans were merciless. The city was ransacked and burned. The surviving population was enslaved. 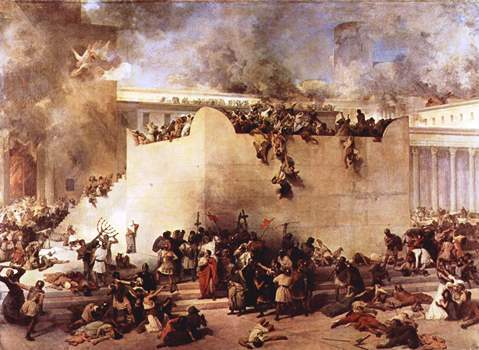 The Second Temple was looted and destroyed. Though it took another three years to seek out and destroy the last of the Judean resistance, the fall of Jerusalem was the de facto point at which Roman victory was assured. Josephus tells us that over a million civilians died during the great siege with another hundred-odd thousand sold into slavery. Though such contemporary accounts are usually considered to be inflated, if the reality was only a fraction of this, then it must still have been one of the most horrific and bloody episodes in antiquity. The importance of the event in the history of their respective civilizations was lost on neither the Romans nor the Jews. 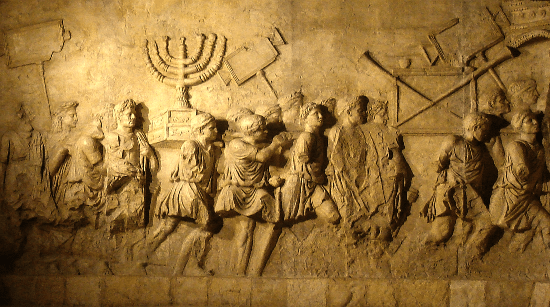 The former celebrated the campaign both on official coins and on the—still standing—Arch of Titus, whilst Jews today still recall the destruction of the Second temple on their annual day of mournful reflection, Tisha B’Av. It is known as primum populi Romani bellum in Iudaeos to the Romans, ha-Mered Ha-Gadol to the Jews, and The Great Revolt to the romantically inclined. However, this brutal and bloody conflict is best and most easily known to most as the First Jewish-Roman War (66-73AD), and is yet another war on an ever-expanding list that proved Rome was no flash in the pan, boom and bust, Alexander the Great style of empire, but one that was here to conquer, to rule, to dominate and to endure. However, there was something different about this conflict—something that made Rome, for a while at least, look like she may have bitten off more than she could chew; this was no ordinary war, this was a holy war… well, for some at least. Of course, Rome had come up against plenty of dedicated and devout people during her inexorable conquest of the known world, but these had all been broadly pagan, polytheistic or invested in the veneration of a living mortal. Militant monotheists with a mandate from the Almighty to protect a land that was not merely their home, but a sacrosanct and sanctified space, were a new kettle of fish – and history bludgeoningly tells us, again and again, that people who are willing to fight for a cause greater than themselves are not those that one would wish to meet on the battlefield. However, like a mohel at a baby-shower, we’re getting ahead of ourselves. The complicated origins of this titanic tussle for the Jewish (and burgeoningly Christian) holy land date back a couple of generations prior to the outbreak of hostilities in 66AD. Indeed, the source of this tension can be traced back to a controversial figure who, at the time, was perhaps the most important man in the history of Judea, one whose acts and deeds have often been crassly misinterpreted or blurred into a peculiar religious mythology. 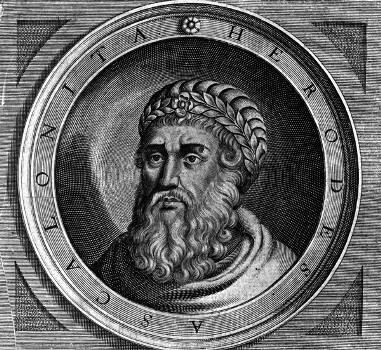 We are, of course, talking about the King of the Jews himself… Herod the Great. We remember Herod (ruled Judea 37-04 BC) from Sunday school as the infanticidal antagonist of the Nativity story. While there is no reliable evidence for this cull of the innocents, it does fit in rather neatly with what we know about the character of this mega-lo-maniacal client-king of the Romans. bloodthirstiness, as well as his toleration and support for non-Jews, his perceived bias for the Jewish diaspora, high taxes, and the fact that he was a convert, not a born Jew, meant that the Jewish population of Judea began to strongly resent Herod and, at the time of his death, needed little encouragement to turn their discontent into open rebellion. This manifested itself in the form of an uprising led by the (capital ‘z’) Zealot, Judas of Galilee, in 6AD. This was in direct response to another bible class staple, the Census of Quirinius – itself a result of the fact that Rome had assimilated Judea into its empire in the same year, ending the small amount of autonomy it had as a vassal. As the decades progressed, it became clear that the fragility of the empire’s newfound multiculturalism was in danger of being exposed. This was true across the Eastern Mediterranean as several provinces, particularly Egypt, struggled with the conflicting realities of being under Roman law, enjoying Greek culture and juggling elements of the pagan and Jewish faiths as well as the quasi-divine worship of the emperor. That religious sensitivities could easily boil over into open violence was recognised even by the mad, bad, and dangerous Emperor Caligula (ruled 37-41AD) who, unhappy he wasn’t receiving due veneration from his Hebrew subjects, wanted to erect a huge statue of himself inside the Temple of Jerusalem, but was finally convinced to shelve this particular piece of blasphemous and incendiary narcissism. Various small riots and scuffles marked the decades preceding the conflict, to find out what finally set the tinder-box ablaze, we have to turn to the pages of Josephus. in the first century AD and, as such, is a key figure in corroborating the life and crucifixion of Jesus (as well as the stoning of Jesus’ brother, James). Much like Polybius centuries before, Josephus, though taken prisoner by the Romans, quickly showed the worth of his intellect and connections and was soon granted his freedom and used by the Romans as a tactical ally and go-between during the war. That he was taken prisoner at all is either a stroke of fate or a mark of the scholar’s cunning as, being trapped in a cave with forty of his comrades, they opted to assist each other in suicide rather than surrender to the Romans. They did this by stabbing every third man in a circle – some scholars suggest that Josephus may have made a swift and brilliant mental calculation in order to avoid his own death. However, this extremist barbarity only galvanised the Jews, who had, until then, been deeply divided as to how to deal with the Romans. First Jerusalem, then wider Judea as a whole, broke out in open revolt against their occupiers and oppressors. It is one of the most enduring and dramatic images from antiquity, one that widens the eyes, dilates the pupils, quickens the pulse and ignites the imagination – especially when we hear about it in childhood. Once heard, the moment is forever emblazoned on the mind’s eye: the African general, Hannibal, perilously crosses the craggy and frozen Alps, leads a daring raid on the Northern Italian plains, and takes the fight to the most organised and efficient war machine the world has ever seen… and all of this done astride the back of an elephant! Glossing over, for one second, that large dollop of artistic license that would have made even Livy blush, what else can we say about the self-proclaimed third greatest general who ever lived (behind Alexander the Great and Pyrrhos of Epeiros, if you’re interested)? 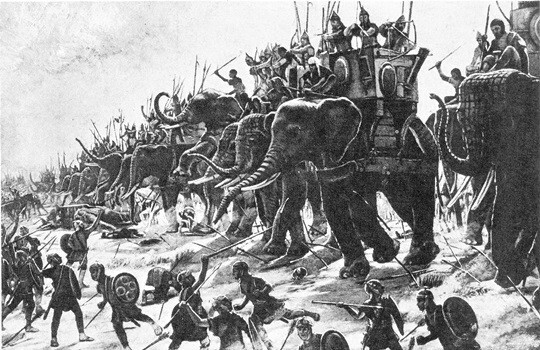 Well if, unlike mine, your mind wasn’t stuck on repeat going ‘elephants…elephants…elephants’ when you first heard the story, you might remember Hannibal’s and Carthage’s demise at the battle of Zama in 202BC; a battle that gave rise to one of Republican Rome’s greatest ever heroes, Scipio Africanus. N.B. Scipio’s is obviously still held in pretty high regard, as he is evoked in the third line of the Italian national anthem. So, what happened to change the fortunes of the man who humiliated the Romans at the Battle of Cannae in 216BC (at which as many as 70000 Roman soldiers are reported to have died), then pushed his army on to the gates of The Eternal City itself in 211BC? In short, the question we’re asking is… (elephants…elephants…stop it! )… why was Hannibal defeated? Many believe the root of the entire Hannibal versus Rome conflict was a family affair; the unfinished business of his father, Hamilcar Barca. Hamilcar was an outstanding general who led guerrilla raids against the Romans between 247 and 242BC – tactics that he thought would bring about the eventual demise of the empire. Thus, in an ancient parallel of the epiphany Hitler received in his hospital bed at the end of WWI, when Carthage surrendered to Rome in 241BC, the betrayal led to a wrath which led to an obsession – Hamilcar wanted to see Rome on her knees. This bloodlust intensified when Rome took advantage of Carthage’s dispute with her unpaid mercenaries, broke the terms of the peace treaty, and annexed Sardinia and Corsica. N.B. The particular irony here is that the Roman stereotype of a Carthaginian was one who was both devious and cunning. The African general, Hannibal, perilously crosses the craggy and frozen Alps, leads a daring raid on the Northern Italian plains, and takes the fight to the most organised and efficient war machine the world has ever seen… and all of this done astride the back of an elephant! Rome, with her citizen militia, would be doomed to failure; a more circuitous and patient approach was needed. Luckily, as the Carthaginian relationship between the government and the military was much looser than in Rome, Hamilcar didn’t need to wait for permission to go about his business; he fled to Spain and began carving out his own fiefdom. 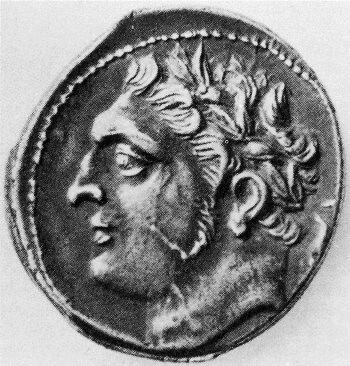 Whilst, officially, this was part of the Carthaginian Empire, Hamilcar was very much autonomous and acted accordingly; he married his sons to Iberian women, made the indigenous people swear loyalty to him personally (rather than to Carthage), and even issued his own currency. This strong command, personal loyalty and not inconsiderable wealth was the bedrock upon which Hannibal could begin to amass a force to even consider an assault on Rome. Hand in hand with this is the myth of the sacred oath that Hamilcar Barca made Hannibal swear en route to Spain in 237BC: ‘never to show goodwill to the Romans’. This is often interpreted as a lifelong, inherited and unbreakable vendetta. So, Hannibal spent his upbringing by his father’s side learning the arts of politics and warfare, and, just as importantly, learning how to hate the Romans. Indeed, perhaps our best source on the Hannibalic Wars, Polybius, believed that Hamilcar’s wrath was the driving force for Hannibal’s Roman expedition. were what allowed Hannibal to be in the position to make such a name for himself in a manner that eclipsed his father’s considerable achievements. However, Hannibal’s single-mindedness may have been what brought about his downfall. Had Hannibal returned to Spain after his historic victory at Cannae then he may have been able to wage war against the Romans on ‘home’ turf (and perhaps even destroy Scipio to-be-Africanus). 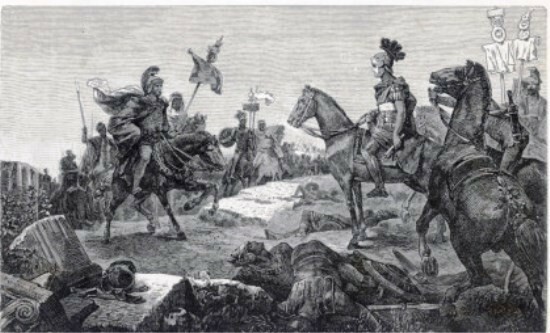 Indeed, though it was his most famous moment, that moment of irrepressible glamour, the very fact that he crossed the Alps in the late autumn of 218BC is considered, by some, to be tactical blunder in itself as many of his precious war elephants and troops died in the process. That Hannibal had learnt to loathe the Romans was, in a way, a millstone around his neck. Had he merely wanted to obliterate Rome, then his task may have been simpler, but he wanted to humiliate her, to see her reduced to a humble and insignificant city-state and force a war-indemnity upon her. Such a grand mandate required a grand ego, an ego that Hannibal, the self-proclaimed third greatest general, may not quite have possessed. Without the unequalled arrogance of an Alexander figure, Hannibal never quite convinced anyone that he was the man to rent Rome asunder. Indeed, even though he parked his troops outside the gates of Rome in order to draw Roman troops away from the besieged rebel town of Capua, the act was barely met with a raise-eyebrow of Roman acknowledgment. The siege of Capua proved too much for the city to withstand. The Romans, swift and merciless to the traitors, completely obliterated it. To rub salt into the wound, and demonstrate a fantastic ‘keep calm and carry on’ attitude, the land on which Hannibal was camping was sold at auction for its full price. This was a bitter blow as Capua was supposed to be one of the success stories of the invasion, although, generally, Hannibal had little success in recruiting Italian towns to his cause. Although many were dissatisfied with rule from Rome, there was a strong case of ‘better the devil you know’ for many settlements. Not only was Hannibal a foreign barbarian, but he used Gaulish mercenaries. It is difficult to fully communicate the disdain the Italian towns felt for their neighbours from Gaul – they were the Roman bogeyman, even the bravest amongst whom were considered as nothing more than a ‘noble savage’. When it came to confidant leadership, Hannibal had nothing on the Roman Senate. They never allowed themselves to contemplate that Carthage was anything other than an inconvenience to be dealt with in due course. In stark contrast to the Carthaginians, who crucified their unsuccessful generals, if a Roman consul suffered a military defeat… what of it? He’d be replaced in a couple of years and the next would-be hero would have his chance at immortality. Money? No problem. That was pouring in from the east. Men? There was always more arrow fodder that could be drafted into the ranks (Rome itself had two legions stationed within her walls). If it were only this, Roman arrogance, a frenzied father’s bitter bile, and obstinate Italian towns which Hannibal had to contend with, to rail against, or to shatter at source, then he may have had a chance. Unfortunately for him, this was only the tip of the iceberg. Different political systems and degrees of political competency in Rome and Carthage were hugely important to the eventual defeat of Hannibal in the Second Punic War (218-201BC). Not once during the conflict did the Romans entertain the idea that defeat was an impending possibility, not even after suffering the worst military reverse in their history at the Battle of Cannae (216BC). This stiff-upper-lip attitude was even more impressive when we consider that Cannae was preceded by the disaster at Lake Trasimene (217BC), where fog conspired with a Carthaginian trap to allow them to successfully decimate some 30,000 Roman soldiers, and the Battle of the Trebia (218BC), where Hannibal tricked the slow-witted Romans, under the command of Tiberius Sempronius Longus, into wading into the freezing December waters before ambushing them to the tune of another 30,000 casualties. But these were all blunders of tactics and warfare on the ground. Such poor leadership was sharply contrasted with sound, sensible and resolute decision-making in the Senate. 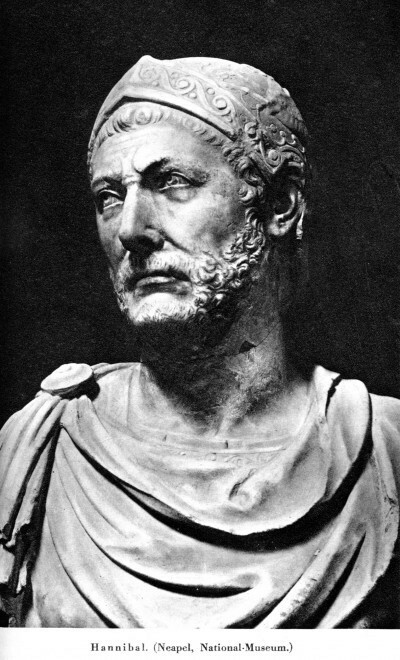 Indeed, the very moment Hannibal set foot in Northern Italy the Senate dispatched a force (led by Publius Cornelius Scipio – father of Africanus) to the Spanish mainland to attempt to cut supply lines there, a policy they mirrored in the Aegean where Philip V of Macedon threatened to offer aid to Carthage. Also, at home, the Senate showed a merciless, efficient approach. They urged Latin towns to scorch their earth rather than allow Hannibal’s troops to live on it and dealt severely with any town in Italy which showed sympathy towards the Carthaginian cause; the pitiless annihilation of Capua being the best example. In contrast, Carthage kept politics and the military rather more separate. There did not seem to have been any clear, centralised military plan – certainly not one where the head of the army and the centre of government were singing in harmony from the same hymn sheet. Additionally, Carthage sent only 5% of its possible reinforcements to Hannibal throughout the war. What is more, unlike the Romans, Carthage treated her African colonies with contempt, cruelty and disdain; they didn’t even bother to leave them with adequate fortifications. Thus, when Rome finally swept into the continent, they were greeted with little military or civic resistance. But it was affairs in Hispania, not Italy or Carthage, which determined the course of the war. Spain proved an excellent stomping ground for the Romans, not only in regard to restricting supplies to Hannibal, but also as an arena in which the talents of the young Scipio Africanus could blossom. The decision of the Senate to appoint Scipio to Spain with proconsular powers in 211BC was for a very simple reason… he was the only viable candidate. 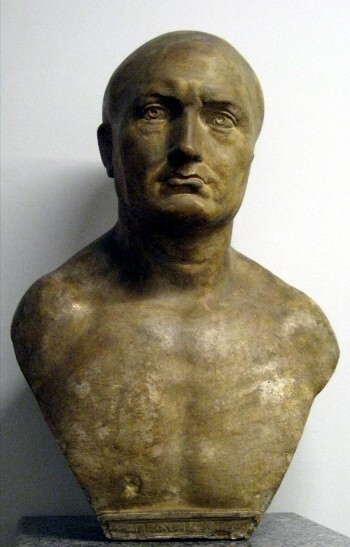 Following a number of high-profile Roman deaths at the hands of Carthage, Scipio, despite his tender years, was the natural choice for the position. Doubts amongst some factions of the Senate to entrust someone so young with such an important task may have been quelled by Scipio’s legendary arrogance (he compared himself to Jupiter) and infectious personality. Indeed, according to renowned historian G.P. Baker, the Senate ‘liked his youth, his courage, his family… and admired his impudence;’ but even still, ‘never before in all the history of Rome had an authority so great been vested in a man so young and inexperienced’. The Senate’s faith paid off – Scipio set about conquering Spain in an almost Hannibalic manner. After brilliantly taking New Carthage and securing their prized silver mines, Scipio, on the order of the Senate, went to prevent Hasdrubal Barca from crossing into Italy and meeting up with his brother. However, Hasdrubal showed himself worthy of the family name – he sent a decoy force to engage Scipio and slipped over the Alps in with little fuss (having learnt from the mistakes of his brother no doubt). Despite some resistance in the Senate, Scipio was allowed to go to Africa to end the war once and for all. 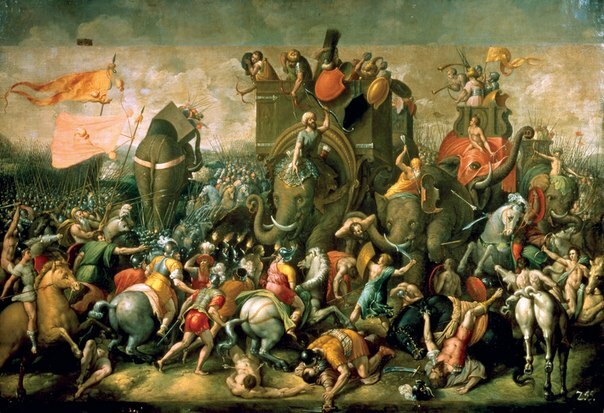 Just before the decisive battle of Zama, he and Hannibal met face to face and are were said to have been impressed with each other; a factor that may explain why Scipio was reluctant for Rome to pursue the defeated general after Carthage fell. Indeed, at Zama (202BC), Scipio paid Hannibal the ultimate, if rather backhanded, compliment of using Hannibal’s own tactics from the battle of Cannae against him. Although Zama is universally viewed as the effective end of Carthaginian resistance, by that time the war was already lost and victory for Rome merely a matter of time. Interestingly, the single most important battle that led to the defeat of Hannibal was one at which he was not even present. The battle of Metaurus (207 BC) not only prevented Hannibal from gaining reinforcements, one of which was his brilliant brother Hasdrubal, it was also the battle that changed public opinion in Rome. Before, defeat had been unimaginable, but victory also looked a long way off. For the first time since the conflict began, the Romans believed that victory was not only obtainable, but likely; they believed that they could not expel Hannibal from Italy, but also push on and conquer Carthage itself. Though the Second Punic War is often boiled down to Hannibal versus Scipio, there were two unsung, and still relatively unknown, generals who turned the table for Rome at Metaurus. The peculiar and cantankerous Livius and the fearless and obdurate Nero were the men who confronted Hasdrubal on the plateau of St. Angelo (in central Italy), forcing him into a long and stamina-sapping battle, made all the more difficult for Hasdrubal by the roaringly drunk status of his Gaulish mercenaries. Hasdrubal, a gallant solider to the last, saw his troops were faltering and made one last, forlorn effort by charging directly into the Roman ranks where he was promptly slain. In one gruelling moment Hannibal had lost his brother, his greatest general, 60,000 troops and the initiative in the war. Cannae had been avenged. The Senate, recognising the importance of the moment, voted three days of thanksgiving for the magnificent triumph. Hannibal came face to face with the reality of his situation when Nero tossed Hasdrubal’s head into the Carthaginian ranks at Canusium; a triumphant and mocking gesture from an army who had been on the back foot for so long. Hannibal, like so many others, had failed to bring Rome to her knees. Though it’s interesting to note the myriad of factors that may have counted against him—the blind anti-Roman wrath he inherited from his father, the poor planning of, and lack of reinforcements from, the Carthaginian government, the resolution of Rome and the skill of Africanus—the truth is that he never really stood a chance. Rome’s supplies of troops were inexhaustible when compared to Hannibal’s. 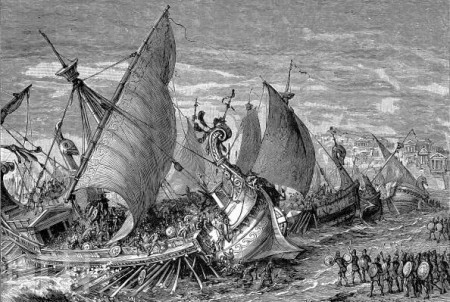 Even at Canane there were 5,700 Carthaginian casualties, and considering that he only entered Italy with 26,000, even his great victories were bringing about his eventual demise. As a personal footnote to the end of the war, Hannibal actually continued to be a thorn in Rome’s side for nearly twenty years after Zama. As a man on the run he became Rome’s public enemy no.1 – some historians have compared Rome’s obsession with catching and killing him to America’s pursuit of Osama Bin Laden post 9/11 – and found himself being entertained at the courts of some of the most exalted leaders in the Mediterranean world. Indeed, Rome’s foreign policy in the post-war period was heavily dictated by other states’ willingness to help them in their pursuit of Hannibal. 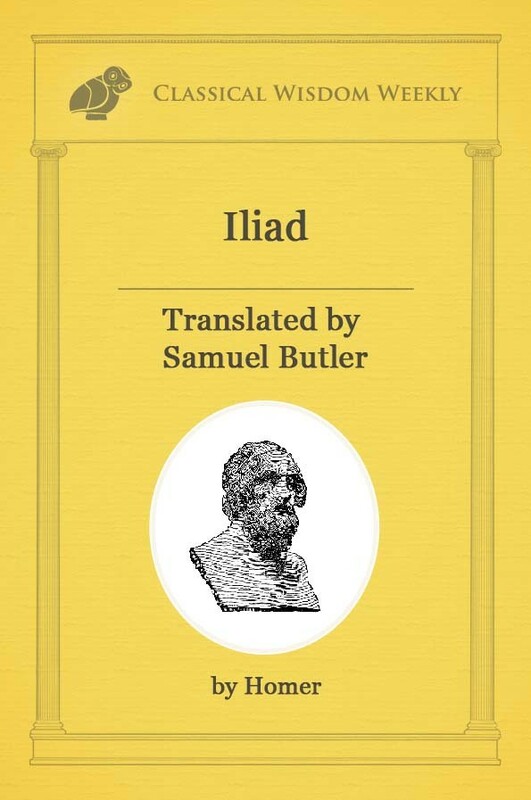 “Let us relieve the Romans from the anxiety they have so long experienced, since they think it tries their patience too much to wait for an old man’s death”. 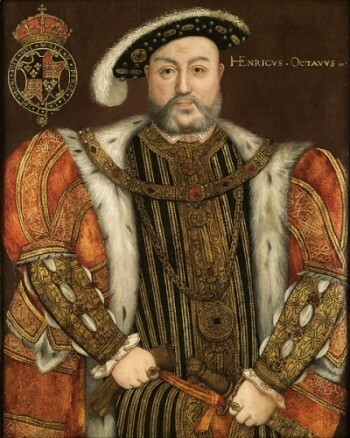 As a great crusading nation, as a centre of monasticism, as the frontline resistance against the pagan Viking hordes, England had long been a stronghold of Christianity before the day that Henry VIII broke with an obdurate Vatican, ransacked the monasteries and established a church separate from that of Rome – one based on his own unique family values; a church of purity, goodness, trust and devotion. Before that day and since, England and Christianity have gone together like tea and crumpets; even today, when only 6-12% of Britons regularly attend a Christian service, Queen Elizabeth II is still not only the UK head of state, but also the head of the Anglican Church. But where did it all begin? What were the humble origins of Christianity’s stronghold in ‘this other Eden’ and, more specifically, what role did the Romans have to play? Well, obviously the Romans were involved in British affairs long before the advent of Christianity, while Jesus was still only a twinkle in God’s eye. 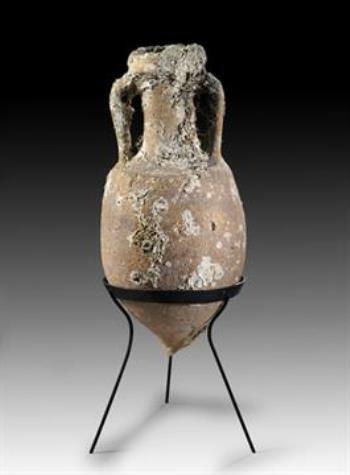 Though we have evidence of wine amphorae dating back to 120BC – proof that Rome was happy to trade the luxury item with the bibulous Celts – Rome’s first real foray into Albion was under the campaign of Julius Caesar in 55-54BC. Thus, Britain was already firmly under the Latin yoke before the BC/AD changeover. 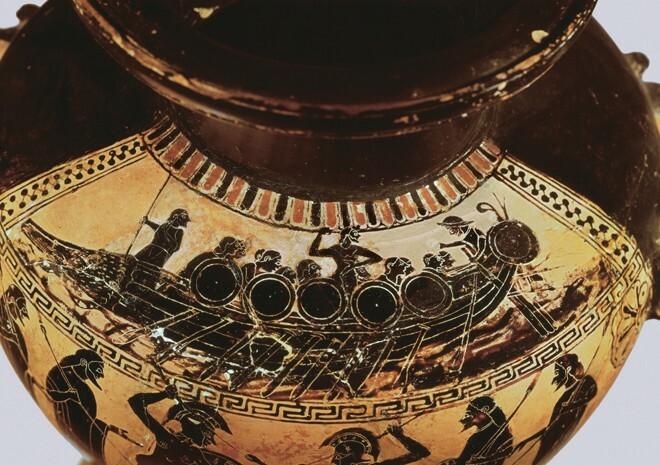 Vessels called amphorae were used to transport wine and olive oil. And, it’s worth noting that, even before Chi-Rhos, Alphas, and Omegas were being daubed all over public monuments, Roman religion was strongly influential on those who lived on that drizzly rock at the edge of the world. The spiritual malleability of the native population shouldn’t be as surprising as perhaps it is. Not only did Britain have its own pantheon of gods that could be loosely equated to, or assimilated with, Roman gods, but it lacked a unified dogma about those gods’ characters. In other words, whilst Nodens or Andrasta may have been worshipped all over the country, their physical features, powers and even particulars of worship may have differed from tribe to tribe. The Romans, as was their wont, stepped into this spiritual power vacuum, but were smart enough not to enforce worship of Jupiter, Mars, Venus et al, but instead allow assimilation to occur naturally, or indeed, not at all. That said, the pagan British gods did not survive totally unmolested. It was common to see native gods given a more Romanesque appearance in their dress and features. Also, many of the incumbent deities were equated with their Roman counterparts and even merged into them, as the following inscription proves: “To the god Mars Nodens, Flavius Blandinus, drill-master, willingly and deservedly fulfilled his vow”. Such hybrid worship does not seem to have been taken as a slight, but a reasonable and natural compromise. Indeed, rectangular Romano-Celtic temples came into being that were deemed acceptable to both sets of worshippers. “Roman soldiers made dedications to Celtic gods and rural dwellers erected temples to Roman gods” (D. Watts). The major caveat to this great, first amendment love-in concerns druidism; a practice outlawed on account of its penchant for human sacrifice. However, by and large, Britain can be said to have been something of a melting pot, a religious hub on the fringes of civilisation. And thus we come to a different god, one who offered his followers a chance of life after death, who purified with blood, who was born on 25th December of a virgin mother, had twelve followers, who died and was resurrected, whose followers bore the mark of the cross and who was known as the light of the world. Yes, we are, of course, talking about Mithras. 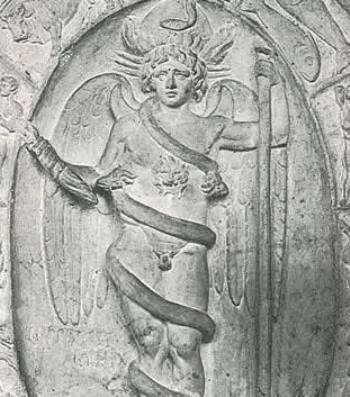 Mithraism, despite being an eastern religion, was popular throughout the empire, particularly with the army and, much like with the pagan Celtic/Roman assimilation, its presence in Britain may have eased the way for its usurper, Christianity. 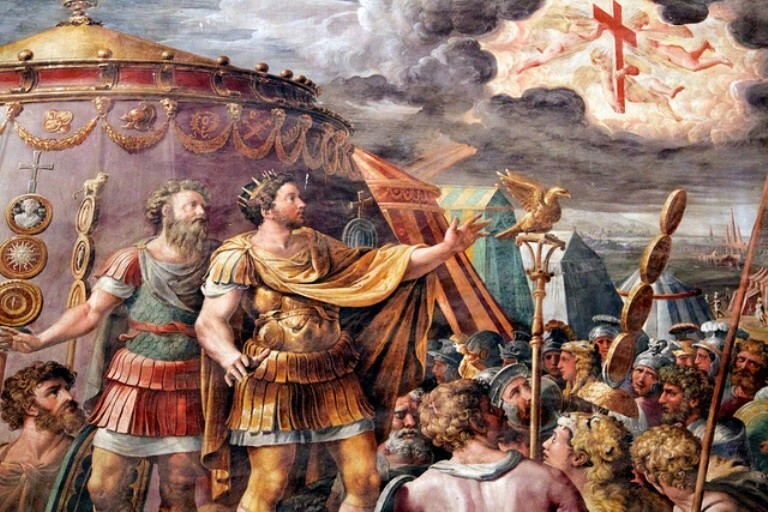 Britain certainly played some sort of role in Christianity’s origins as it was at York that Constantius I, the Augustus of the west, died, leaving his son Constantine as the leader of the army in the western empire – an army who considered him the natural heir to his father’s title. This is the same man who would become Constantine the Great and would one day unify the divided empire under one flag, one emperor and, crucially, one, capital ‘g’ God. It has been claimed, and is certainly possible, that Constantine either picked up, or learned about Christianity while in Britain – though it could just have equally been anywhere he’d travelled in the empire. However, some very fanciful British folklore, chronicled by Henry of Huntingdon and Geoffrey of Monmouth, would later claim that Constantine’s mother, St Helena, was actually the daughter of the British King Cole of Colchester (who many suspect was the ‘jolly old soul’ from the nursery rhyme). The figures of King Arthur and even the Tudors themselves are often transplanted into this ridiculous and murky myth; meaning that Henry VIII, the man who rent asunder England and the church of Rome would have, ironically, been a descendent of Constantine himself. Such nonsense, though pleasing, is not worth dwelling on! What is more poignant regarding Christianity’s relative popularity in Britain is that, once it became the state religion of the Roman Empire, the ruling classes and the urbanised populations converted swiftly to the new faith. As already mentioned, back in the first and second centuries AD the upper echelons of British Celtic society often willingly and openly embraced Roman ideas and practices (including religious ones). Even still, it was common that, in more rural areas, pagan practices clung on a lot stronger than they did in the towns. Although Britain had fourteen identified churches in the south and only one in the north (Lincoln), the strong and constant military presence in the north of England meant that soldiers, many of whom may have graduated to Christianity from Mithraism, gave the new faith a stronger presence than it may have otherwise had. Christianity likewise became popular with middle-class opportunists who may have used any pagan persecutions to make a claim for temple lands. It was also extremely well-liked among women, as they were finally able to exert some autonomy. This was because, upon becoming Christian, they no longer had to blindly follow the whims and caprices of their fathers or husbands, but could claim overriding and supreme loyalty to the One True God.